Painting a door is one of those jobs that can be done at home by any practical home owner. It doesn’t have to be complicated and you certainly don’t have to pay a professional to do the job for you. It is a good way to integrate your doors with your overall colour scheme or add a vibrant of contrasting shade to a room with an otherwise neutral tone. By following this simple step-by-step guide, from preparing the door for painting, to leaving the paint to dry and cure, you can guarantee a professional finish throughout your home. For more advice about painting your house, inside and out, see our expert guide. If you are painting your front door, the process is exactly the same as for a wooden interior door, but you have the added complication of the weather and security to contend with. 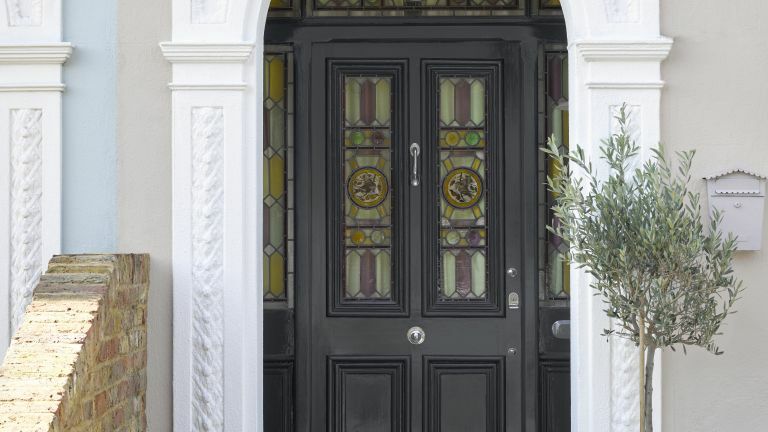 If you have a new door to paint (see our guide to choosing a new front door for advice), leave the old one in position until the new one is ready to hang. This may mean removing the old door temporarily while you size up and cut the new one. Paint under cover if possible, but always choose a day with no forecast of rain, strong wind or any other adverse conditions that could affect your work. If you are re-painting your existing front door, remove it from the hinges and remove any door furniture. Masking tape windows to protect them from paint. If you do not have anything to temporarily block the doorway, work in a place where you can keep an eye on the door for security. Ideally, the paint needs a day to cure but this isn't always possible when the door needs removing. If this is the case, start first thing and invest in good quality primer and paint that will dry in good time. See our pick of the best brushes and rollers and the best paints for wood. Before starting to paint your door, take it off its hinges and lay it flat on a paste table. Remove any handles, door knobs and hinges. Make sure the surface is clean, dry and is free from dust and grease. Scrape off any loose paint, remove any mildew with a solution of one-part bleach and three-parts water, and sand thoroughly. Apply a coat of primer using a brush and small roller to help achieve a professional-looking finish. Top tip: If you’re painting an interior door, choose a gloss or satin finish for durability. For exterior doors, like this one, choose an exterior paint. This is Wildlife from Valspar’s Exterior Wood & Metal Trim range. Begin by brushing inset or trim details by hand with a paintbrush so that you can lay an even base coat. Use the brush to feather out the edges of the paint so that there are no drips. Then, use a small foam roller to apply a smooth, consistent paint application across all of the flat surfaces, including the outside edges of the door. Allow to dry for two to four hours, lightly sand in-between coats to encourage good adhesion and add a second coat. Once one side is completely dry, turn it over and do the other side. Leave the door for a full day to allow the paint to cure. Then reattach the handles, hinges and knobs and reattach to the frame.